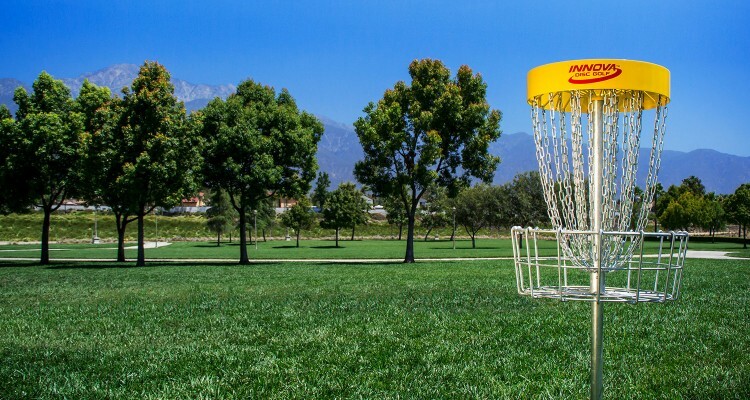 Our DISCatcher® is installed on more disc golf course Worldwide than any other brand. Designed to lower your scores, the DISCatcher® Pro 28 is equipped with 28 chains. The DISCatcher®’s design has 14 outer chains, 7 intermediate, and 7 inner chains. This chain grid catches fast and slow putts, heavy and light discs like no other target. Our stainless steel chain racks, powder coated with bright yellow, are highly visible and built to stand up to heavy use for years. Our catching trays are hot dip galvanized and are over 9″ deep to retain discs. Galvanized poles and stainless steel hardware means the DISCatcher® Pro 28 is in it for the long haul. The DISCatcher® Pro 28 is available in both permanent and portable configurations. The portable configuration has a galvanized metal base with quick release stabilizing screws, allowing you to disassemble and transport the target with ease. The portable is perfect for use at home, as a demonstration target, or to add a hole to a course for tournament play. The permanent model utilizes a hot dipped galvanized lockable installation sleeve to allow for relocation to different hole positions and to deter theft. A locking tab is included that will allow you to protect your investment in the finest disc golf target available. Yellow powder-coated finish. 13 gauge stainless steel, 22″ diameter x 4″ outer band. 5/16″ stainless steel rod frame. 4″ x 1 15/16″ I.D. tubing 0.156 wall, drilled and tapped collar. All joints welded. Decals affixed. Hot-dip galvanized 3/8″ steel rod, 5″x15/16″ I.D. tubing 0.156 wall, drilled and tapped collar. All joints welded. Hot-dip galvanized finish. 74″ x17/8″ O.D. galvanized steel pipe, 0.120 wall, drilled. Hot-dip galvanized finish. 3″x115/16″ I.D. tubing 0.095 wall, drilled and tapped. Hot-dip galvanized finish. 24″x 1 15/16″ I.D. tubing 0.095 wall. Align the padlock tab back toward the tee to have the hole number decal face the tee area. We recommend 60-80 lb of concrete for installation. Sprinkler Valve Box Covers make nice finishing treatments to sleeves that will have multiple pin placements. A removable cover both protects mowers from hitting the sleeve, and prevents dirt and rocks from going down the sleeve when target is not in this location. Lock, Sprinkler Valve Box, and concrete not included.